Zipfizz is the only all-natural healthy energy drink-mix powder in a tube that delivers an advanced formula providing a significant amount of vitamins, fewer calories, lower carbohydrates and superior taste. 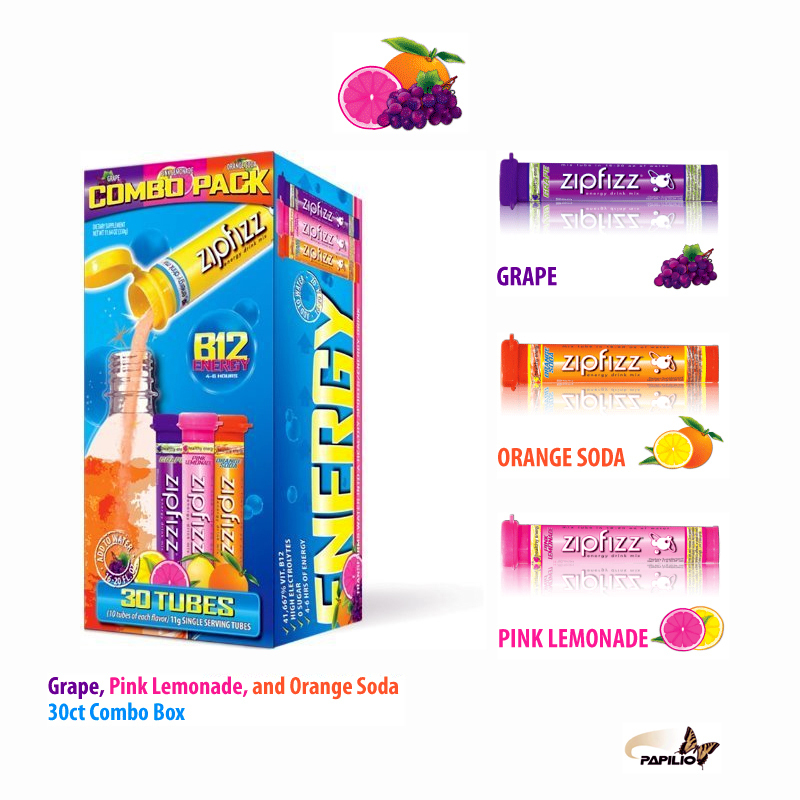 Now enjoy this great combination of three great tastes in the combo box it includes 10 tubes Grape, 10 tubes Pink Lemonade, and 10 tubes Orange Soda Flavor. The sweet tart flavor of deep purple grapes is amazing! It will have you questioning how this energy formula is only 10 calories, 3 net carbohydrates and contains no sugar. Experience the infused fruit flavor of fresh squeezed oranges and a splash of soda reminiscent of a classic orange soda pop from your childhood. Just add water to create a delicious beverage that refreshes you in the hot days of summer or after a great workout at the gym. Now enjoy the flavor and sustained energy. Are you ready! Think of an intense summer heat and a cool refreshing pink lemonade beverage … Ahhh deliciously balanced, light, and refreshing taste in one perfect package. It is packed with the same energy formula as the other Zipfizz flavors now with all natural lemon zing. Enjoy one today! Zipfizz is a healthy energy mix, with only 10 calories, no sugar, and 2 net carbs. It Contains 25 nutrients that give an energy boost usually in about 15 minutes. It is “the healthy alternative to energy Drinks, sports drinks and coffee.” Zipfizz transforms Water into a healthy, energizing performance drink. Most people tell us that about 15 minutes after trying Zipfizz they feel alert, energized, and refreshed . . . but without the jitters that you might get from ephedra, high levels of caffeine, or sugar. CAN I USE A HALF SERVING? Yes. But at least the first time, we recommend you try a whole serving to see how it Works with your body. Yes. It has 100 mgs of caffeine from natural sources of green tea and Guarana. That’s about one-fourth the caffeine in a Tall Starbucks coffee (375 mg) and less than two Excedrin tablets (130 mg). Zipfizz contains no sugar. With only 10 calories, it is sweetened with Xylitol (pronounced “Zy-le-tall”) And Sucralose. Xylitol is a naturally occurring, low-calorie sugar substitute found in berries, fruits and Birch bark. Many dentists recommend chewing Xylitol gum for good dental health. The average person Produces 6-10 grams a day of Xylitol, it is a by- product of sugar metabolism. HOW LONG DOES THE ZIPFIZZ ENERGY EFFECT LAST? Everyone’s metabolism is different. Most people say the alertness from Zipfizz lasts from 4-6 hours. Since Zipfizz energy comes from nutrients instead of high levels of sugar and caffeine, there aren’t the Spikes and crashes that people complain about from other Energy and sports drinks. Zipfizz does contain 100 mgs of caffeine from green tea and guarana. Most pediatricians Do not Recommend caffeine for children. WHAT’S IN IT THAT GIVES YOU ENERGY? There aren’t just one or two ingredients that are doing all the work. The science behind Zipfizz Combines 25 different nutritional ingredients that work together in balance. IS THIS A DIET/WEIGHT LOSS PRODUCT? Zipfizz is not specifically a weight loss product, but it is a great support product for many diet plans. When decreasing calories, people usually complain about feeling sluggish and tired, particularly in the afternoon. With only 10 calories, 0 sugar and 2 net carbs, Zipfizz is a great energizer that can help you stay on your diet plan. HOW MANY ZIPFIZZ SHOULD I DRINK EACH DAY? Not recommended to exceed three servings per day. WHEN IS THE BEST TIME TO DRINK ZIPFIZZ? It depends on your own energy needs. A lot of people drink Zipfizz instead of coffee. It’s great in the Morning and as a mid-afternoon pick-me-up. Athletes like it before a workout because it helps them Train harder, without adding the calories and sugars that other sports drinks contain. We’re also hearing from college students who drink Zipfizz during study hours because it keeps them alert and Awake without the coffee jitters. I’M A DIABETIC. CAN I TAKE ZIPFIZZ? Zipfizz contains no sugar. It is sweetened with Xylitol and Sucralose. We recommend that if you have any special health condition you should consult your doctor before trying Zipfizz, just as you should before making any change to your nutritional habits. American ginseng root extract 317 mg - ** Percent Daily Value not established. Click the button below to add the Zipfizz Healthy Energy Drink Mix Variety Pack, 30-Count to your wish list.